FCI World Champion in 1965. Best male at the World Show in Brünn. 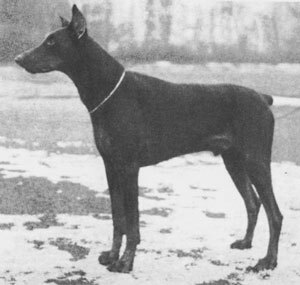 “This red male was the brother to Miko von Fürstenfeld. Although he gained more titles than his brother he had less influence on the breed. He was a short male, well balanced but was shortish neck and low tailset. He was also rather narrow in front but had a very good head and correct bite. He became the brown Bundessieger in 1965 and the Dutch winner the same year. He was an International Champion and best male at the World Show in Brünn. Mascha von Fürstenfeld: SchH 3 and Bundessiegerin in 1965, DDR-Siegerin, Italian Siegerin, German Champion and International Champion. Mecki von Fürstenfeld: SchH 3 and Bundessieger in 1965, Netherlands Champion in 1965, International Champion and best male at the World Show in Brünn. Miko von Fürstenfeld: SchH 1 and International Champion. He is sire to Palma von Ellendonk who in turn was the winner of the D.V. Meisterschaft in 1975 and dam to Bingo von Ellendonk. Vello von Fürstenfeld: SchH 3, DV-DM participant and passed the Körung 'for life' with Körklasse 1 rating. Verry von Fürstenfeld: SchH 3 and D.V. Leistungssieger in 1970. Vilja von Fürstenfeld: Bundessiegerin in 1967.